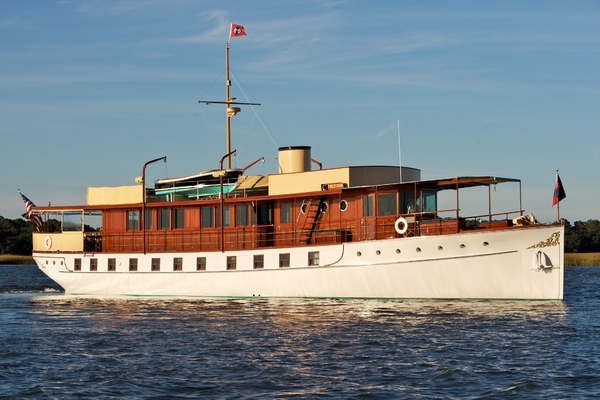 Offers are invited on this yacht, she must sell soon! Owner is well into his next project. This fabulous yacht has very minimal use, with only it's four day run back to Japan after launch and small amounts of day cruising. She has been kept in A1 condition with a full crew and Captain full time on board. She is like new only 1 year old and no expense was spared during her build. Interior design is by LUCA DINI design Italy, with almost all furniture, materials and soft furnishings imported from Portrona Frau in Italy. The owner ordered a long list of upgrades during the build process to make this yacht better and better. Agora II has transatlantic range and has exceptional sea keeping ability. We invite serious offers on this beautiful 105 Horizon Sky Lounge Motor Yacht. United Yacht Sales New Jersey would love to guide you through a personal showing of this 105' Horizon Skylounge Motor Yacht 2013. This yacht for sale is located in Osaka Japan and priced at $5,480,000. For a showing please contact us by filling out the form on this page and we will get back to you shortly! High-gloss wood finish on vertical and horizontal surfaces (Standard Cherry wood knot/Macore/ Bird's eye maple/ walnut). Teak & holly floor in pilothouse. Teak & holly or marble floors in galley. Marble or granite counter top in galley. Carpet (local supply) floor thru boat except wood floor areas. Italian High-quality door lock and cabinet door locks. High-density foam mattress with custom bedding covers. King size bed in master stateroom. Three double or twin staterooms w/ensuite head & shower. Leather bed headboard Master only. Wood bed frames in all cabins. Hanging lockers in all staterooms. Escape hatch with ladder for master stateroom. Halogen ceiling lighting, DC 28V. LED rope lights for safety step lights. LED rope lights under sofas, beds, and valances. Marble or granite counter top and back splash in all heads. Marble or granite floors in all heads. Seamless polyurethane finish in all shower stalls. Towel bars, rings, cup holders, brush, etc. for all heads. Exhaust blower for each head. Inlaid sink with curved wood face for each head. Rear accommodation arrangement plan: In accordance w/ layout plan – to include aft crew quarters, efficiency galley, head and shower, hanging lockers, bunks, storage lockers, A/C. U-LINE ice maker or refrigerator per layout.(max.1). Full size microwave convection oven. One Stidd helm chairs Admiral model. Instrument console with leather covering. “U” shape seats w/ wood high-low table. (In accordance with layout). Heavy-duty SPEICH Stainless steel wipers w/wiper washer system. Variable speed control on each windshield wiper. Full set engine gauges at both stations. Monitoring system for important equipment (bilge pumps, blowers, nav. Lts.). DANFORTH or equivalent magnetic compass at both helms. Fuel and water electrical level gauges. Surveillance camera system (aft deck and engine room). Nonskid fwd deck, Teak Aft decks, teak swim platform and teak steps. Teak cap rail w/o varnish. Two vertical hydraulic anchor winches “Maxwell VWC4000”. Two high tensile 1/2 inch, 300 feet anchor chains. Two stainless steel 100kg anchors. Two stainless steel rollers w/hull side pocket anchors design. Heavy-duty 316# stainless steel cleats and fairlead w/rollers. High bulwark w/ flush mounted deck lights. 4 FRP bulwark side doors. Freshwater anchor chain wash down. Heavy-duty S/S 2² handrail w/1-1/4² stanchions. Stainless flag pole on bow rail. Forward deck storage locker for fender and lines. Sunbathing cushion on fwd deck w/drink holders. Frameless windows clear tempered laminated glass 10 mm for windshield & tinted tempered laminated glass 10 mm for side windows. Stainless steel sliding door for main salon, self locking. Two deckhouse side entrance doors. After deck hidden trash can and sink. After deck high-low dining table (fiberglass or teak). Access flybridge through curved teak steps from after deck, stainless steel handrail. S/S supporting pillars 5” on after deck. Internal boat hook holders on after deck. 2” stainless steel rails around swim platform (removable) at stern. Built-in shower with hot/cold water above swim platform. Swimming ladder extractable or fordable. Solid stainless steel rub rail around upper hull side. Fiberglass rub rail w/stainless steel cap on lower aft hull side. SUNBRELLA canvas covers for flybridge, helm seats, aft deck seat, windshield, sun pad forward cushion and seat, standard shipyard selection. Integral stainless steel handrails around exterior FRP cabinet. Indirect lighting system under all furniture and seats. Stainless steel sliding hatch on F/B deck step opening. FRP cabinet with sink and flush mount Barbecue unit. Oversize drains w/strainers on each corner of flybridge deck with internal overboard drains. Fiberglass radar arch w/antenna bracket. Two TOKAI SUNSHIN search light. Chrome plated BUELL air horns on top of radar arch. Space for dinghy or Jet Ski. LED white light Horizon group logo in P&S. Fire insulation in engine room. Fixed fire extinguisher (FM200) for engine room with remote control. portable fire extinguishers in recessed lockers. Integrated fire alarm system in pilot house, with heat or smoke detector in each cabin. Twin CATERPILLAR C-32A 1600hp diesel engines w/reduction gears. Stainless steel shafts AQUAMET HS 22# or equivalent. High performance 4 blade propellers. Main and intermediate bronze struts w/backing plates. Shaft and rudder packing glands with TIDES Marine dripless seals or equivalent. MMC engine controls with chrome control heads or GLENDENING electronic engine control system at each station. Stainless steel rudder w/zinc plates. Stainless steel emergency tiller in rudder cabin. Custom steering wheels at both stations. Under water exhaust system for engines w/mufflers. Hydraulic 45 hp AMERICAN BOW THRUSTER. HYNAUTIC or equivalent heavy-duty trim tabs with indicators. Engine room clean design with white finish and lightweight floor. Heavy-duty insulated engine room door. Stainless steel overhead grab rail on each side of engine. Engine room AC florescent lights and DC dome lights. DELTA T or equivalent engine room de-mister filters. Engine mounts on one piece white paint steel channel. Engine alarm system for low oil pressure and high water temperature. TRIDENT HOSE for engine exhaust. Two Onan generators 27KW(50hz) or 32KW(60hz)with sound shield. Two GLENDENNING shore power cable masters 50amp w/75’ cable each. Shore power connection, Charles or equivalent ISO boost transformer 50 Amp. Extra shore power plugs(2) on fwd deck. Fiberglass water/exhaust separator for generator. Inverter/Charger XANTREX 4kW/150Amp or MASTERVOLT COMBI 2kW/60Amp (total 2 units). GUEST battery switch (vapor proof). Eight 225 AH AGM batteries for ship‘s service power. All batteries enclosed with boxes and cover. Main electric panel includes AC & DC circuit breakers. 24 volt DC monitoring and main circuit breaker panel. 12 volt cigarette lighter in main helm station. Italian VIMAR switches for lighting system. GFI protection for AC required outlets. Indirect lighting under valance in saloon, staterooms, pilothouse and galley. TV antenna on top of radar arch. 24 volt to 12 volt converter for supply of 12-volt components. Cathodic protection with zinc anodes for shafts, struts,etc. Dimmer system for DC halogen lights in aft deck. Dimmer system for AC halogen lights in saloon, master & VIP cabins. Sub panel design in each zone for electrical distribution. 3,000 Gallons Aluminum fuel tanks w/sight & electric gauges. Dual RACOR 75/1000 MA fuel filters/water separator, each engine. RACOR 500 MA fuel filter for each generator. Oil change pump system for engines & generator. High-volume AC fresh water pressure pump and one DC pump for back up. Fresh water Charcoal filters in main supply pipe and in galley. Fresh-water hose for filling engine and generator expansion tank. Marine grade lines for fresh waster system. Two 30 or three 20 gallon water heaters. Water Maker “Sea Recovery” 1400 gal/day. 200 gallon holding tank w/macerator pump. “Y” valve for holding tank with deck fitting for dockside pump out. Sump pumps system for grey water. Electrical level indicators for holding tank and sump tank. Five electric RULE bilge pumps. Two manual bilge pumps in engine room and forward cabin. High water level bilge alarm. Back up air conditioning sea water cooling pump. Chilled water MARINE AIR air conditioning. One-piece hull lamination and longitudinal stringers. Hull, Deck & superstructure are built with licensed process SCRIMPTM for improved strength and less weight. High-density foam cored construction above water line. Stringers with high density foam coring. Foam cored reinforcement for strength. Interior structural components all properly bonded to hull. Strong collision bulkhead structure for extra safety. INTERNATIONAL brand anti-fouling bottom paint, w/ anti-osmosis treatment.